On Sunday, one reactor at the plant was automatically shut down after a glitch, becoming the second halt in operations in recent weeks. The reactor was running at 40 percent of nominal power, the plant's official website said, adding that radiation at the facility being at the level of 8-12 microroentgens an hour. The error was later announced to have been corrected, and the troubled unit – Power Block # 6 – was plugged back into the network. 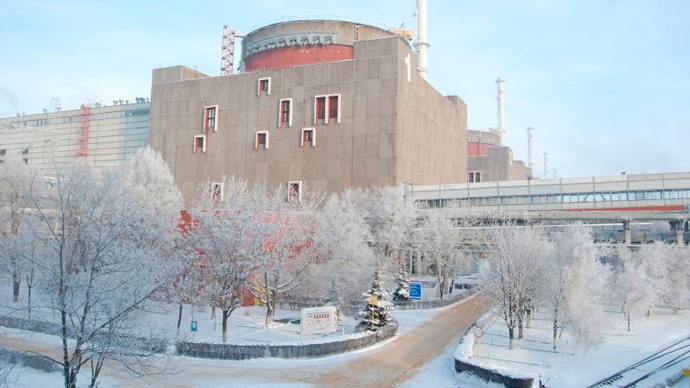 On November 28, Zaporozhye's Unit 3 was switched off for almost a week. The shutdown, which was reportedly caused by a short circuit, was made public five days later, when Ukrainian Prime Minister Arseny Yatsenyuk revealed it during the first meeting of his new Cabinet. The media report indicated that on December 29 the radiation level at the Zaporozhye Nuclear Power Plant was estimated at 0.00505 mSv/yr. According to the World Nuclear Association a typical range of dose rates from medical sources of radiation is 0.3-0.6 mSv/yr. In order to develop radiation sickness, a one-time dose of at least 1,000 to 2,000 mSv would be enough. Meanwhile, between 2,000 and 10,000 mSv in a short-term dose would cause severe radiation sickness with increasing likelihood that this would be fatal. Regarding the November incident, Ukrainian authorities have contacted the International Atomic Energy Agency (IAEA). The agency was informed that "a reactor at the Zaporozhye Nuclear Power Plant remained safely shut down following a short circuit in the plant’s transformer yard last week," its December 3 statement said. Ukraine’s State Nuclear Regulatory Inspectorate has said no radioactive materials were released because of the shutdown, the IAEA added. The incident was preliminarily estimated to be a level 0-rated event on the International Nuclear and Radiological Event Scale, which ranges from 0 to 7. Zaporozhye nuclear power plant is one of the four nuclear power plants in the country, which together supply a large part of Ukraine's energy needs. The Zaporozhyeplant alone, Europe's largest, supplies at least one-fifth of the country’s power needs. It is the world’s fifth-largest nuclear power plant. In the meantime US nuclear power-plant builder Westinghouse Electric Co. has reached a deal with Ukraine's Energoatom in Brussels to provide fuel to Ukraine to lower Kiev's dependency for supplies from Russia. The US company says it will “significantly” increase fuel deliveries to Ukrainian nuclear power plants through 2020, according to a statement released Tuesday. “This increased cooperation between Westinghouse and Energoatom will bring diversification and security of nuclear fuel supplies for Ukraine’s reactor fleet,” the statement reads. Westinghouse, which has been operating in Ukraine since 2003, says that under terms of the contract, the US firm will employ its global supply chain to “manufacture the fuel and components making use of its facilities in the US and Europe.” No other details were provided. “Westinghouse looks forward to providing a full range of products and services to Ukraine and the global VVER market with proven experience in digital controls, fuel, refueling, inspection services and plant upgrades and refurbishments,” said Yves Brachet, Westinghouse president for Europe, Middle East and Africa. About 44 percent of power in Ukraine is generated from nuclear facilities, according to the International Atomic Energy Agency. Earlier this year, Kiev has agreed to extend Westinghouse existing cooperation agreement until 2020.